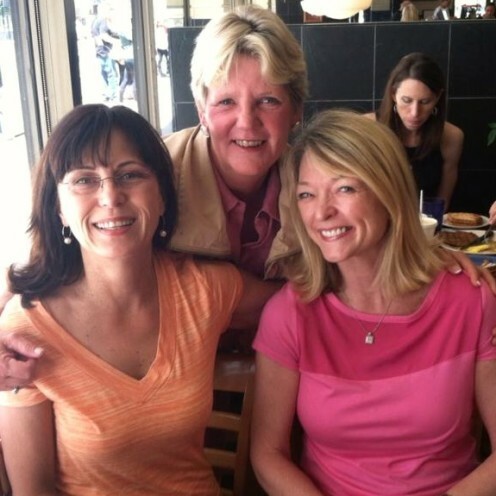 Yesterday I attended a very special Holiday Brunch. It’s an annual get-together of about a dozen of my college sorority sisters. It’s something that I look forward to every year because I cherish the wonderful relationships we have forged over, dare I admit, decades of friendship. 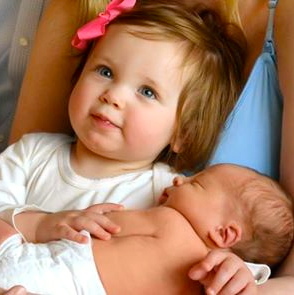 and new babies and grandchildren. The cycle of life through years of deep friendships, it’s a wonderful part of my life. Right after I graduated from college I got a job as a High School Home Economics teacher in Hawaii. A fellow Home Ec. teacher gave me a really delicious recipe for Cranberry Bread that I’ve been making every Christmas since. 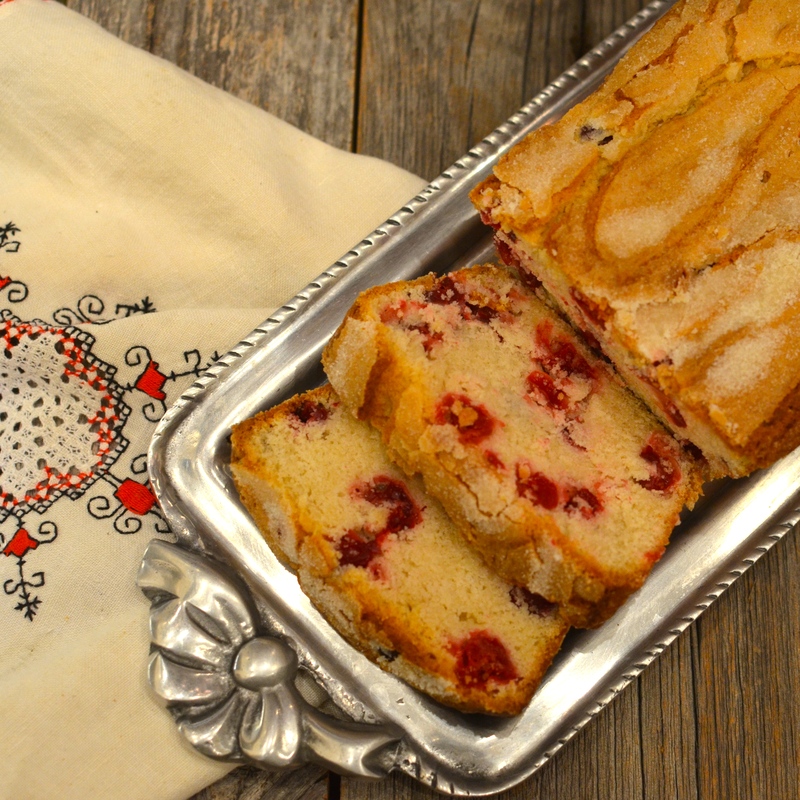 Most years I make Cranberry Bread as my contribution to our sorority brunch, and today I thought I’d share the delicious recipe with you. This is what you’ll need to make it, except that I failed to include shortening in the photo. 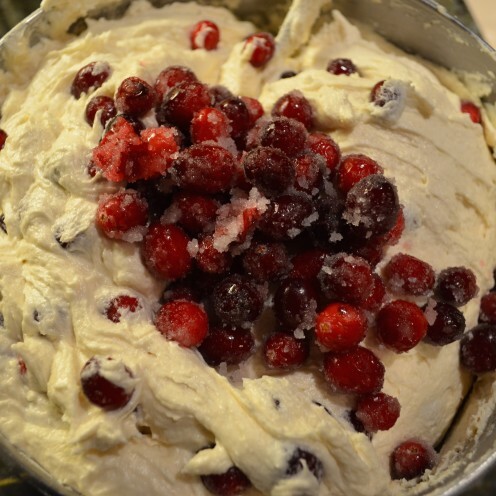 Also note that when I made my Cranberry Bread I tripled the recipe so the photos reflect a triple batch of ingredients. 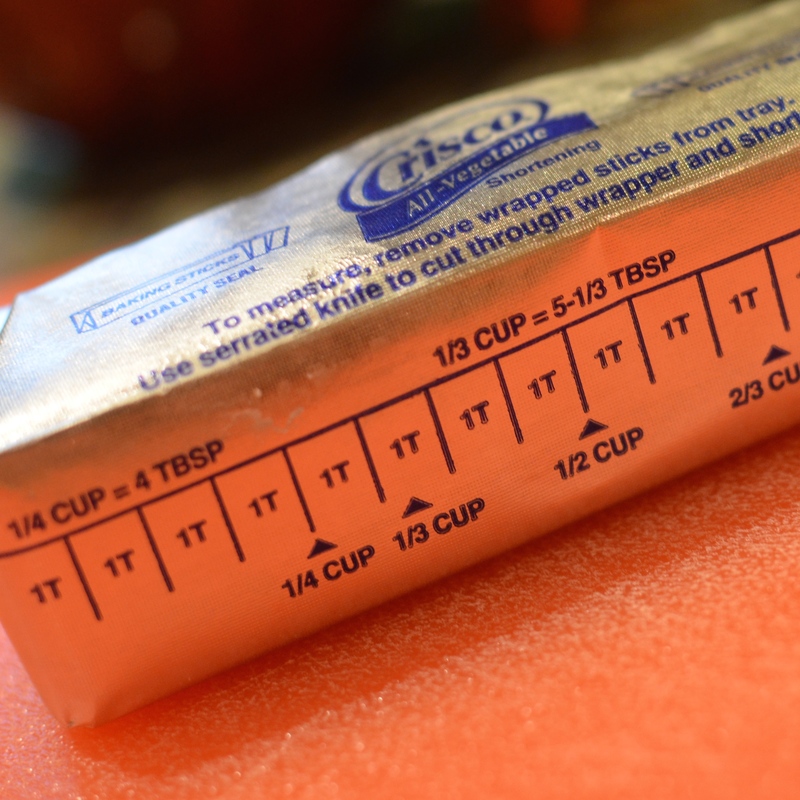 Start by preheating your oven to 350º F. Then grease and flour a large loaf pan. Next add 2 cups of all purpose flour to a medium sized mixing bowl. To the flour add 2 teaspoons baking powder and 1/4 teaspoon salt. 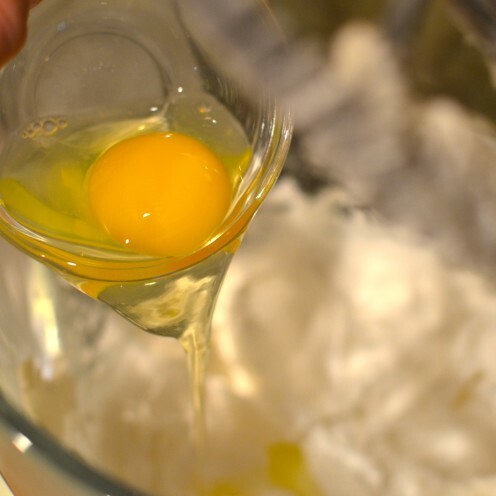 Using a whisk combine the dry ingredients together and set the bowl aside while you prepare the wet ingredients. To the bowl of your standing mixer add 1 cup shortening, and 1 cup granulated sugar. 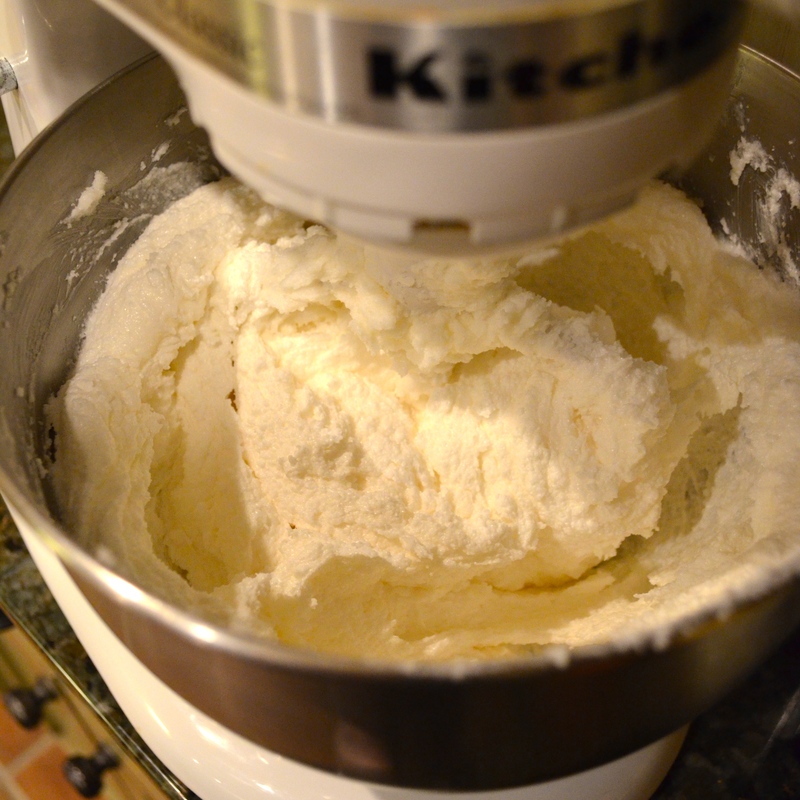 Cream the mixture until it is light and fluffy. 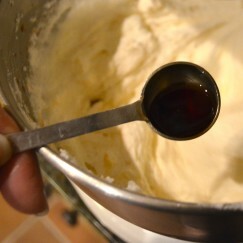 and 1/2 teaspoon vanilla extract and mix to combine. Next you will need 3/4 cup of milk. Add 1/3 of the milk to the creamed mixture, alternating with 1/3 of the dry ingredients, and mix to combine until you have exhausted all of the milk and dry ingredients. To prepare the cranberries for baking add 6 ounces (1/2 bag) fresh cranberries to a strainer. 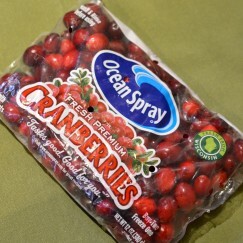 Sort through the cranberries, removing any bad ones, then rinse them clean. 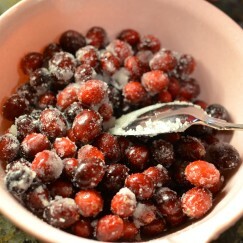 Next add 1/4 cup granulated sugar to the cranberries and mix to coat the berries with the sugar. 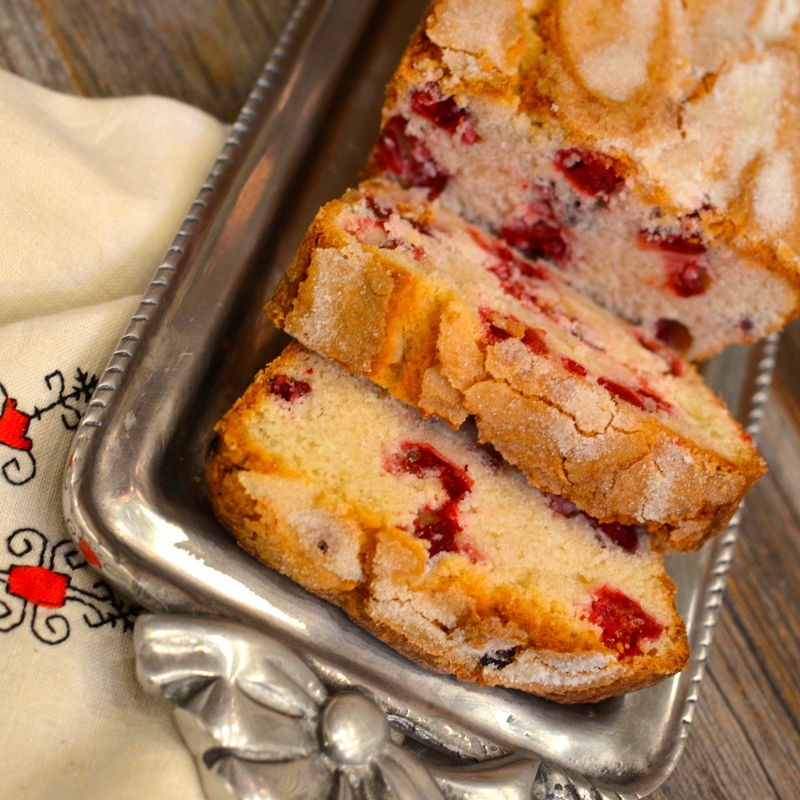 This will help to keep the berries from sinking to the bottom of your Cranberry Bread during the baking process. 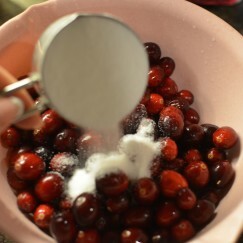 Now, using a rubber spatula, gently fold the fresh cranberries into the batter. 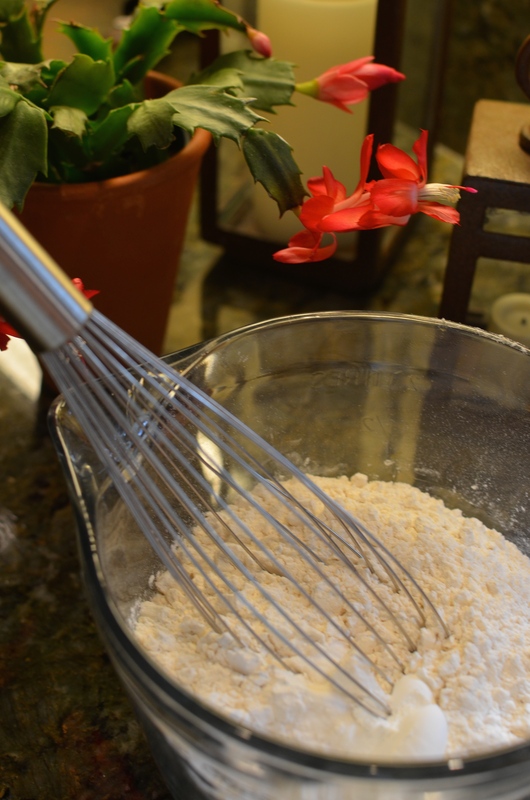 Finally, pour the batter into your prepared loaf pan and sprinkle with granulated sugar. Set your timer and bake for approximately 1 hour. 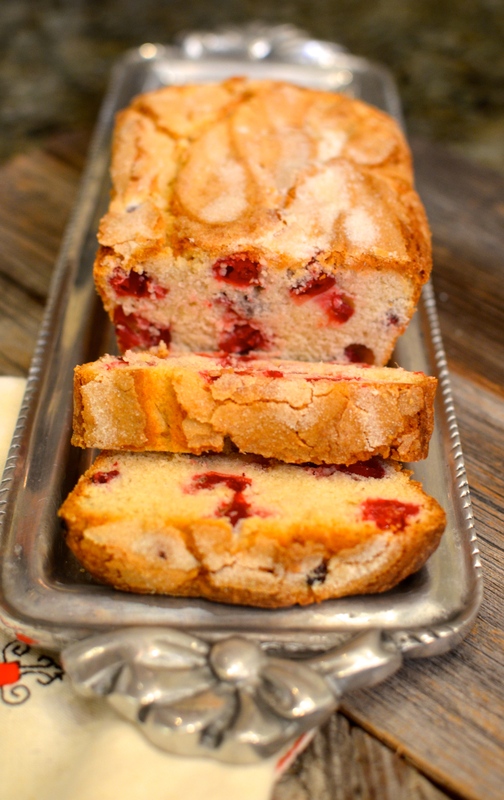 The Cranberry Bread is done when a tester inserted into the center of the loaf comes out clean. Allow the bread to cool in the loaf pan for 5 minutes. 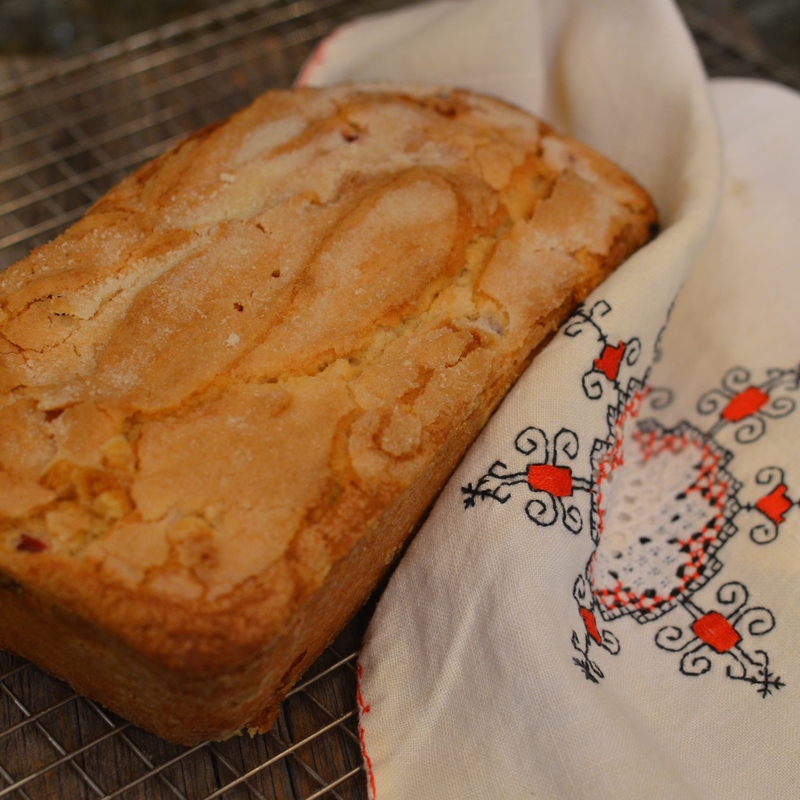 Then, loosen the sides of the loaf and transfer it onto a cooling rack. Cool completely before slicing. To store wrap loaf tightly in plastic wrap, then slip it into a ziplock freezer bag. It will keep at room temperature for 2 days. This bread also freezes well. 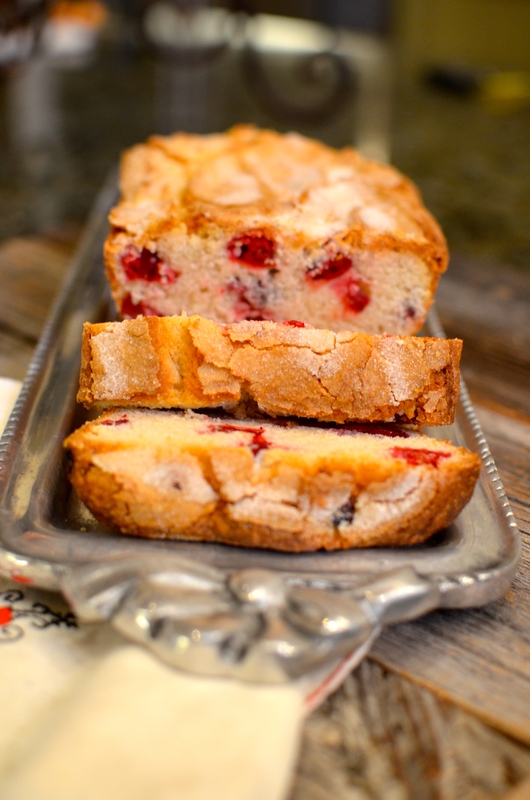 By the way, Cranberry Bread makes a great “Gift From the Kitchen”. Why not triple your recipe and give it away as hostess gifts? This sweet and tangy quick bread is perfect for a holiday brunch. And it's quite festive looking as well. Makes 1 large loaf. 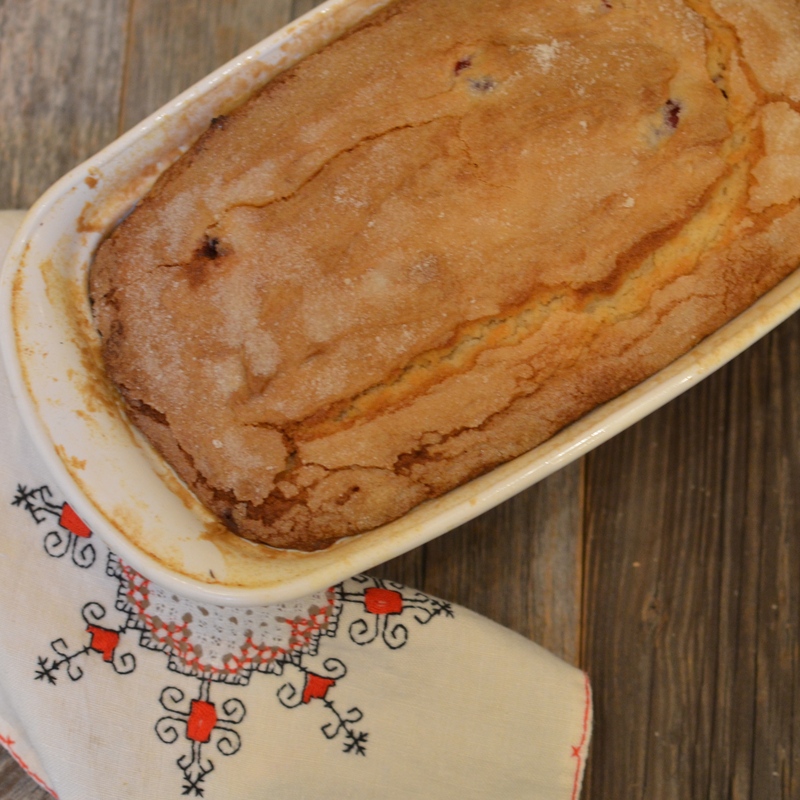 Start by preheating your oven to 350º F and grease and flour a large loaf pan. 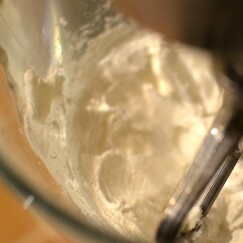 Add the flour, baking powder and salt to a medium sized mixing bowl. Using a whisk combine the dry ingredients together and set aside. 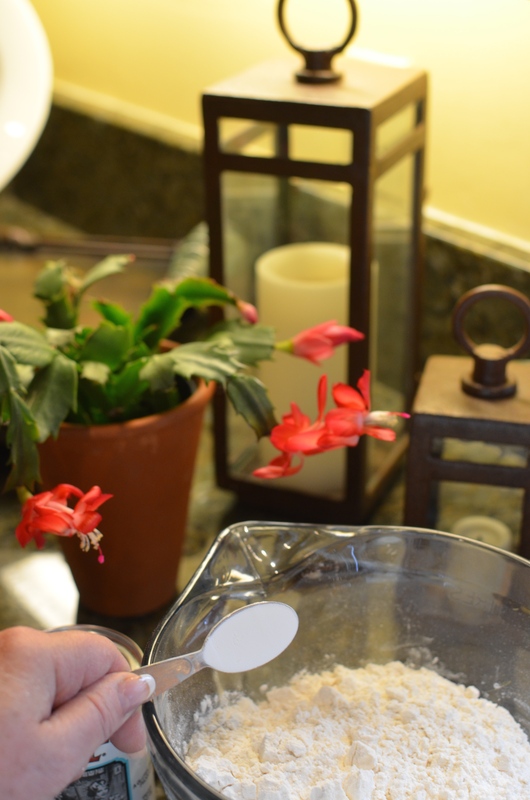 To the bowl of your standing mixer add shortening and 1 cup granulated sugar, reserving the additional ¼ cup sugar for later. 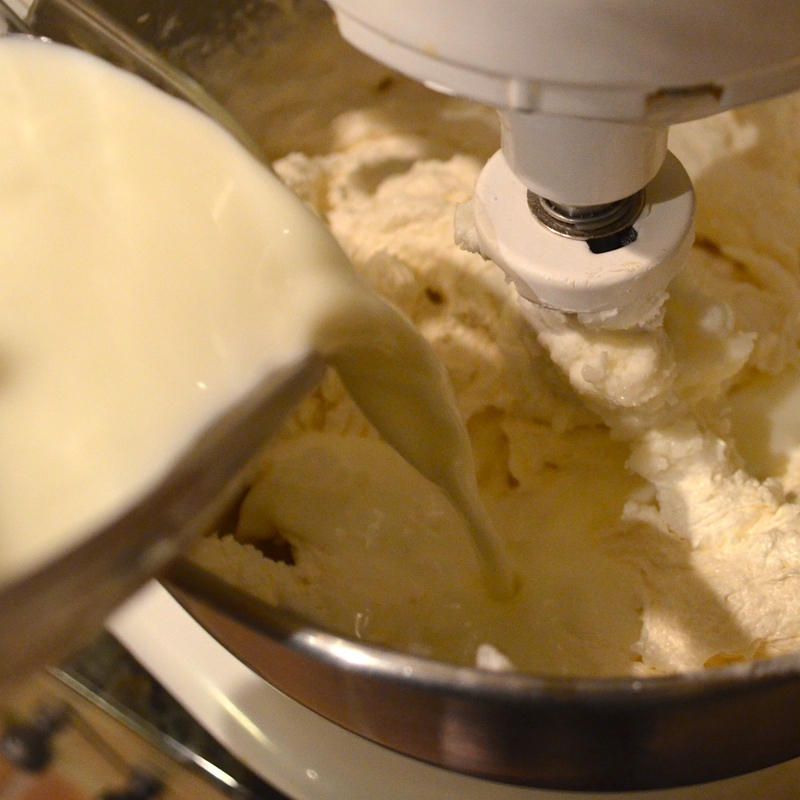 Cream until it is light and fluffy. Add the egg and vanilla extract and mix to combine. Add ⅓ of the milk to the creamed mixture, alternating with ⅓ of the dry ingredients, and mix to combine until you have exhausted all of the milk and dry ingredients. 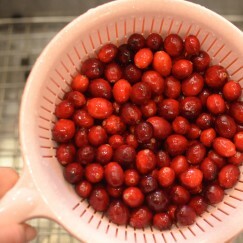 Add the cranberries to a strainer and sort through them, removing any bad ones, then rinse them clean. 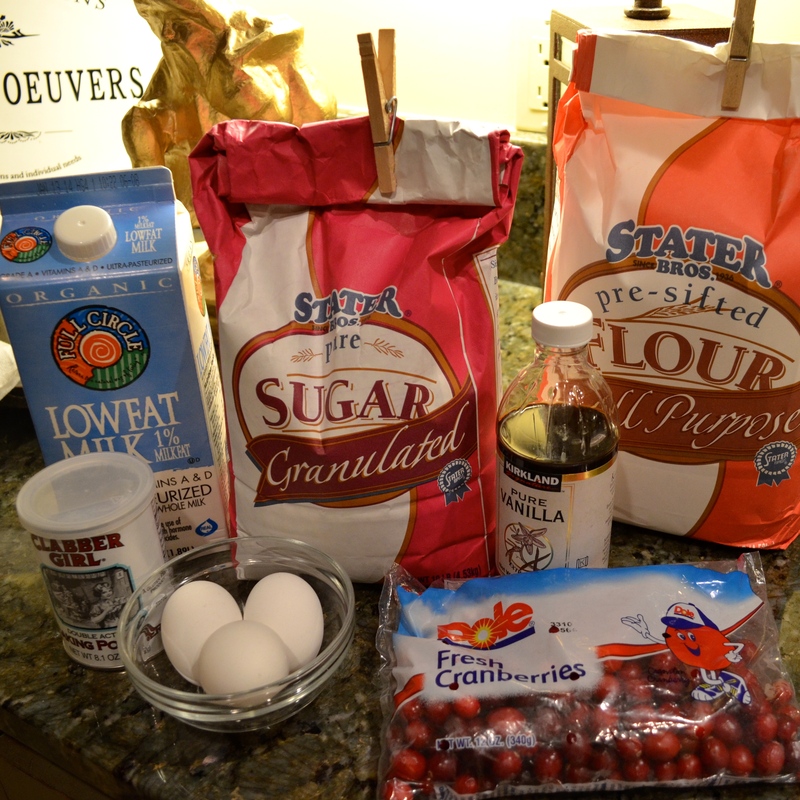 Next add the reserved ¼ cup granulated sugar to the cranberries and mix to coat the berries with the sugar. 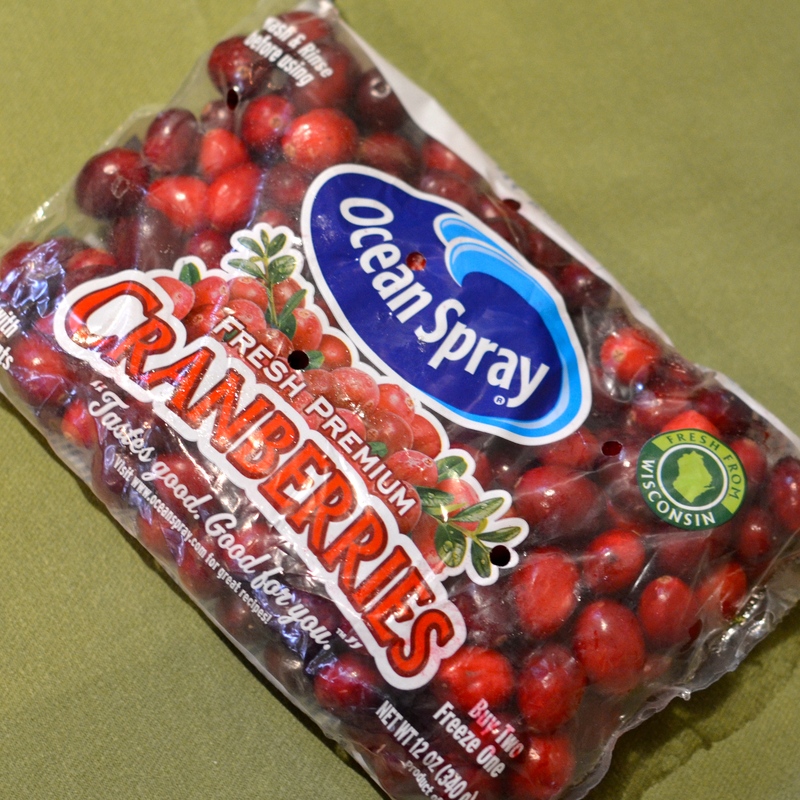 This will help to keep the berries from sinking to the bottom of your Cranberry Bread during the baking process. Using a rubber spatula, fold the fresh cranberries into the batter. Pour batter into prepared loaf pan and sprinkle with granulated sugar. Set timer and bake for approximately 1 hour (baking times vary). The bread is done when a tester inserted into the center of the loaf comes out clean. Allow bread to cool in the loaf pan for 5 minutes. Then, loosen the sides of the loaf and carefully transfer it onto a cooling rack. Cool completely before slicing. Serve at room temperature. This bread freezes well. 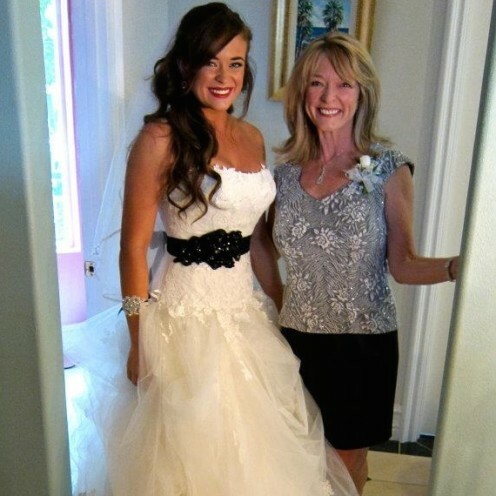 Wrap tightly in plastic wrap and place in a ziplock freezer bag. 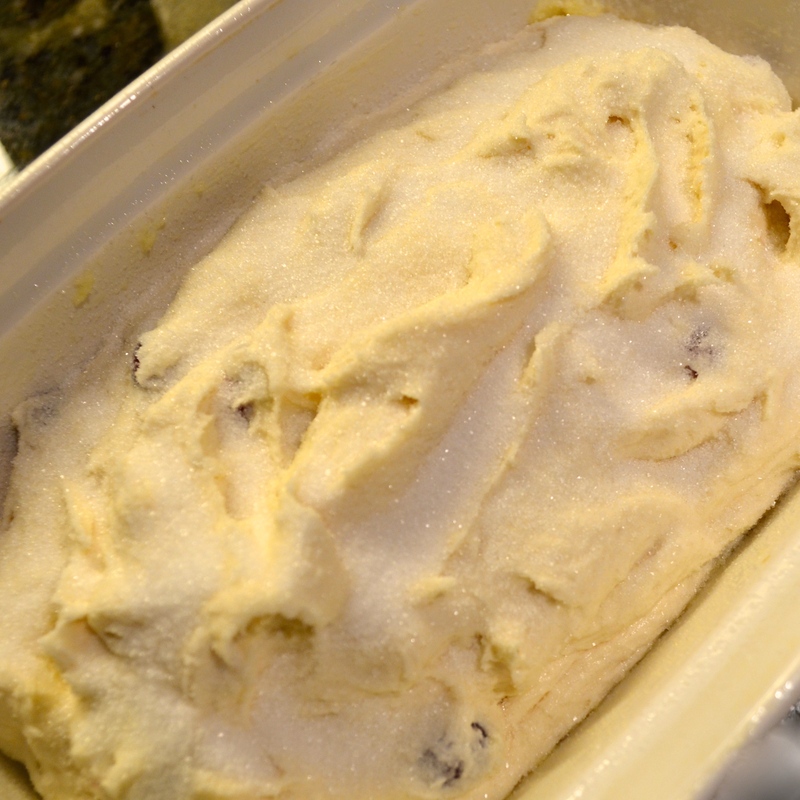 Keeps in the freezer at least 1 month.